Dan Betts and Marlene Scholsohn scored 0.15 masterpoints with a 51.32% game at In Tempo Bridge Club. See full results of this game. Dianne Hall and Judy Cecka scored 1.02 masterpoints with a 55.17% game at In Tempo Bridge Club. See full results of this game. Paul Zatulove and Gene Friedman scored 0.34 masterpoints with a 51.92% game at In Tempo Bridge Club. See full results of this game. Dan Betts and Mel Cofman scored 0.73 masterpoints with a 56.97% game at In Tempo Bridge Club. See full results of this game. Penni Brodey and Marianne Victor scored 0.16 masterpoints with a 51.2% game at In Tempo Bridge Club. See full results of this game. Peter Mattingly and Judy Cecka scored 0.98 masterpoints with a 57.05% game at In Tempo Bridge Club. See full results of this game. Marvin Waxman and Judith Rubin scored 0.46 masterpoints with a 49.44% game at In Tempo Bridge Club. See full results of this game. Nancy Brooks and Lynne Holmes scored 0.88 masterpoints with a 59.86% game at In Tempo Bridge Club. See full results of this game. Marianne Victor and Jay Victor scored 0.33 masterpoints with a 47.64% game at In Tempo Bridge Club. See full results of this game. Marvin Waxman and Jerry David scored 1.22 masterpoints with a 59.38% game at In Tempo Bridge Club. See full results of this game. Patricia Herington and Cindy O'Connell scored 0.56 masterpoints with a 54.57% game at In Tempo Bridge Club. See full results of this game. Beth Hoffman and Sandee Metosky scored 0.18 masterpoints with a 52.61% game at In Tempo Bridge Club. See full results of this game. Marilyn Goesling and Marianne Victor scored 0.22 masterpoints with a 53.97% game at In Tempo Bridge Club. See full results of this game. Dan Betts and David Rosencranz scored 0.68 masterpoints with a ★60.48%★ game at Bridge On Shea. See full results of this game. Vivienne Cummings and Annie Berle scored 0.90 masterpoints with a ★61.67%★ game at Bridge On Shea. See full results of this game. 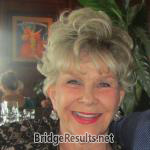 Joan Ohre and Judy Cecka scored 0.84 masterpoints with a 59.94% game at In Tempo Bridge Club. See full results of this game. Marvin Waxman and Judith Rubin scored 0.55 masterpoints with a 55.49% game at In Tempo Bridge Club. See full results of this game. Marilyn Goesling and Marianne Victor scored 1.99 masterpoints with a ★62.5%★ game at In Tempo Bridge Club. See full results of this game. Kathi Sailer and Patricia Herington scored 0.79 masterpoints with a 58.5% game at In Tempo Bridge Club. See full results of this game. Marvin Waxman and Jerry David scored 0.70 masterpoints with a 51.21% game at In Tempo Bridge Club. See full results of this game. Nancy Brooks and Lynne Holmes scored 0.35 masterpoints with a 53.02% game at In Tempo Bridge Club. See full results of this game. Dianne Hall and Judy Cecka scored 1.75 masterpoints with a ★63.33%★ game at Clark Ransom. See full results of this game. Marvin Waxman and Jerry David scored 0.23 masterpoints with a 54.15% game at In Tempo Bridge Club. See full results of this game. Marvin Waxman and Judith Rubin scored 0.47 masterpoints with a 52.43% game at In Tempo Bridge Club. See full results of this game. Jane Kantor and Kathleen Malo scored 0.44 masterpoints with a 52.52% game at In Tempo Bridge Club. See full results of this game. Beth Hoffman and Sandee Metosky scored 0.24 masterpoints with a 53.73% game at In Tempo Bridge Club. See full results of this game. Marilyn Goesling and Marianne Victor scored 0.44 masterpoints with a 55.87% game at In Tempo Bridge Club. See full results of this game. David Rosencranz and Dan Betts scored 1.04 masterpoints with a ★64.4%★ game at In Tempo Bridge Club. See full results of this game.